Want to know what properties are currently for sale on the Eastern Shore? Click on the link at the bottom of this page, which will show you all the listings posted by real estate companies in the area. There are hundreds of little towns here on the Shore, with only a handful having more than 100 people. This map shows the larger communities. If you want to know precisely where a property is, contact me and I will help you locate what interests you. You can call me at 757-710-8852 or email me at dave@reachwaterfront.com. 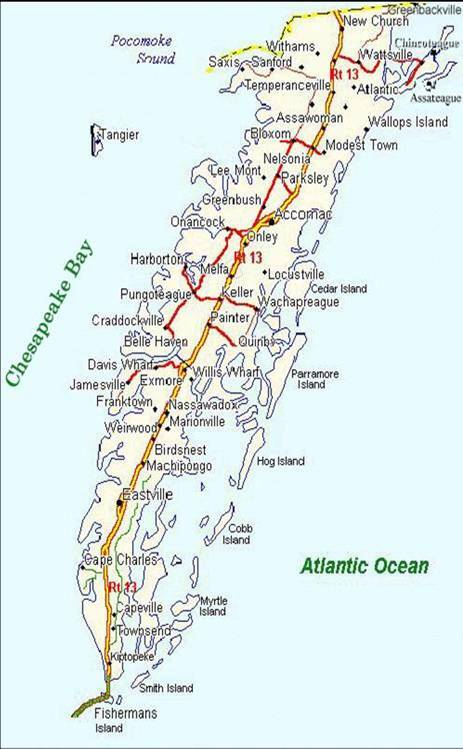 As you can see from the map, the ocean side of the Eastern Shore is bounded by barrier islands, 18 in all, only one of which, near Wachapreague, is inhabited with about 10 houses. While many properties along the Atlantic side of the Shore are described as "oceanfront", you should be aware that, in most cases, you do not have an unobstructed view of the ocean and your waterfront will likely be marsh land rather than pounding surf. However, these properties normally have navigable channels directly to the ocean. The best unobstructed water views actually are on the Bay. As for prices, waterfront is the most expensive. If you are looking for something directly on the Chesapeake Bay or the Atlantic, you should expect prices to start at $450,000 regardless of size. "Creek" front properties are more desired by boaters, who can dock right in front of their property. The Shore is filled with creeks, most of which are "boatable", but be sure to check. These properties start at about $250,000 for a lot and, like other waterfront, rise according the number of feet along the shore and the overall size of the property. Interior lots with access to the beach usually starts at $60,000, and lots further inland with no beach access are less. So why should you pick me to be your agent? I mean, let's face it, most folks call the agent who is listing the property they are interested in. My answer is that very few folks actually buy the property they call about, but the DO buy something else an agent finds for them. So maybe it makes sense to start with an agent who knows her stuff. Waterfront homes and land, farm land, small town residences, vacation homes, historic houses and estates, investment property and even commercial---I know it all. I'm a good listener---probably the most important skill an agent should have. I'll do my homework, keeping you up to date on new listings. If you've decided to invest I've helped lots of folks choose properties most likely to appreciate in value. I work at your pace, not mine and promise not to pester you. I'm professional, ethical, caring and fun.